Kristina Hunter came to University Park from Philadelphia in the fall of 2013. In May, she will graduate with both a bachelor of science degree in special education and a master of education degree in Curriculum and Instruction Integrated Undergraduate-Graduate Degree program. 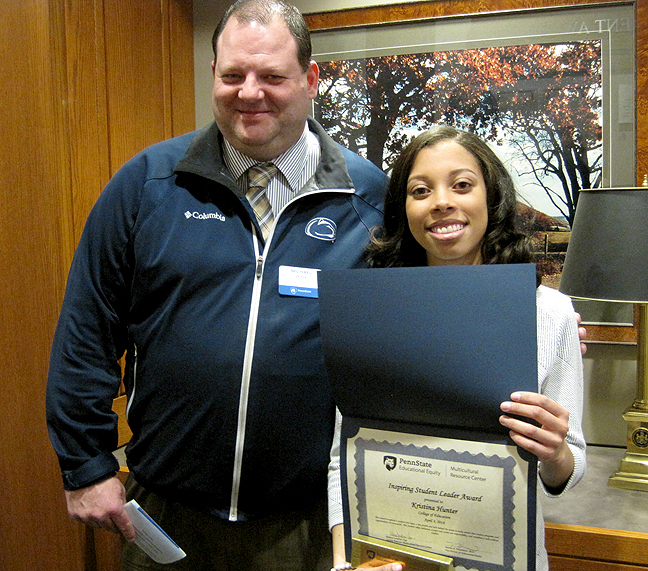 Along with consistently earning Dean’s List honors, Kristina has excelled beyond her academic coursework as well. She is currently a student teacher in an autistic support classroom at Ebner Elementary School in Altoona, Pennsylvania, and has served as an instructor at University Park’s Summer Reading Camp and the Centre County Correctional Facility. Additionally, Kristina revived the Multicultural Education Student Association (M.E.S.A.) within the College of Education, seeking to specifically meet the needs of underrepresented students while also working closely with assistant teaching professor Efrain Marimón on two key projects: The Urban Teaching Collaborative Online Tutoring Program and The Restorative Justice Initiative (RJI).